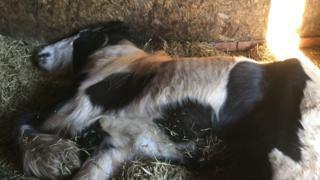 A young horse has died after being thrown out of a trailer on a road - one of four horses found dumped in Nottinghamshire in four days. A passer-by saw the driver "speed off" and called for help but the filly - named Brave Valentine by rescuers - died within a day. Another horse was found dead and two fouls dumped within 30km (19 miles). Police believe the same van and trailer may have been used in each case and are trying to track down the owner. Since the death of Brave Valentine, found on 14 February, another horse was found dead by a dog walker in a lay-by and two underweight foals were found on the side of a road. The two foals - now named Bubble and Squeak - are recovering with the charity Help for Horses. Janice Dixon, a vet at Help for Horses, was called out to help Brave Valentine in Ricketts Lane, near the village of Blidworth, but said when she arrived the horse was nothing but "leather skin on a skeleton". Witnesses said it took eight people to help Brave Valentine stand and get into the trailer. The next day she died of a suspected stomach disease. Ms Dixon said: "She'd obviously been ill for some time, I'm guessing they thought she didn't have long to live and rather than pay for her to be disposed of professionally and in a manner that is deserving, it was easier to dump her by the side of the road. "It would have cost between £150 and £250 to do it properly."